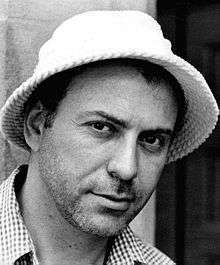 Alan Wolf Arkin (born March 26, 1934) is an American actor, director, comedian, musician and singer. With a film career spanning more than 55 years, Arkin is known for his performances in Popi, Wait Until Dark, The Russians Are Coming, the Russians Are Coming, The Heart is a Lonely Hunter, Catch-22, The In-Laws, Edward Scissorhands, Glengarry Glen Ross, Thirteen Conversations About One Thing, Little Miss Sunshine, and Argo. He has been nominated for the Academy Award for Best Actor twice for his performances in The Russians Are Coming, the Russians Are Coming and The Heart Is a Lonely Hunter. He won an Academy Award for Best Supporting Actor for his performance in Little Miss Sunshine and received a Best Supporting Actor nomination for his performance in Argo. Arkin was born in Brooklyn, New York City, the son of David I. Arkin, a painter and writer, and his wife, Beatrice (Wortis), a teacher. He was raised in a Jewish family with "no emphasis on religion". His grandparents were immigrants from Ukraine, Russia, and Germany. His parents moved to Los Angeles when Alan was 11, but an eight-month Hollywood strike cost his father his job as a set designer. During the 1950s Red Scare, Arkin's parents were accused of being Communists, and his father was fired when he refused to answer questions about his political ideology. David Arkin challenged the dismissal, but he was vindicated only after his death. In 1968, he appeared in the title role of Inspector Clouseau, after Peter Sellers disassociated himself from the role, but the film was not well received by Sellers' fans. Arkin and his second wife, Barbara Dana, appeared together on the 1970–71 season of Sesame Street as a comical couple named Larry and Phyllis who resolve their conflicts when they remember how to pronounce the word "cooperate." His best known films include his Oscar-nominated Wait Until Dark, as the erudite killer stalking Audrey Hepburn; The Heart Is a Lonely Hunter; Catch-22; The Seven-Per-Cent Solution; Little Murders; The In-Laws; Glengarry Glen Ross; and Little Miss Sunshine, for which he won a Best Supporting Actor Oscar; and Argo. His portrayal of Dr. Oatman, a scared and emotionally conflicted psychiatrist treating John Cusack's hit man character Martin Q. Blank in Grosse Point Blank was also well received. His role in Little Miss Sunshine, as Grandfather Edwin, who was foul-mouthed and had a taste for heroin, won him the BAFTA Film Award for Best Actor in a Supporting Role and the Academy Award for Best Actor in a Supporting Role. On receiving his Academy Award on February 25, 2007, Arkin said, "More than anything, I'm deeply moved by the open-hearted appreciation our small film has received, which in these fragmented times speaks so openly of the possibility of innocence, growth and connection". At 72 years old, Arkin was the sixth oldest winner of the Best Supporting Actor Oscar. In 2006–07, Arkin was cast in supporting roles in Rendition as a US senator and The Santa Clause 3: The Escape Clause as Bud Newman (Carol's Dad), starring with Tim Allen, Martin Short, Elizabeth Mitchell, Judge Reinhold and Wendy Crewson. On Broadway, Arkin starred in Enter Laughing, for which he won a Tony Award, and Luv. He also directed The Sunshine Boys, among others. Arkin's directorial debut, in 1969, was a 12-minute children's film, People Soup, starring his sons Adam Arkin and Matthew Arkin. Based on a story of the same name he published in Galaxy Science Fiction in 1958, People Soup is a fantasy about two boys who experiment with various kitchen ingredients until they concoct a magical soup which transforms them into different animals and objects. Arkin's most acclaimed directorial effort is Little Murders, released in 1971. Written by cartoonist Jules Feiffer, Little Murders is a black comedy film starring Elliott Gould and Marcia Rodd about a girl, Patsy (Rodd), who brings home her boyfriend, Alfred (Gould), to meet her severely dysfunctional family amidst a series of random shootings, garbage strikes and electrical outages ravaging the neighborhood. The film opened to a lukewarm review by Roger Greenspan, and a more positive one by Vincent Canby in the New York Times. Roger Ebert's review in the Chicago Sun Times was more enthusiastic, saying, "One of the reasons it works, and is indeed a definitive reflection of America's darker moods, is that it breaks audiences down into isolated individuals, vulnerable and uncertain." Arkin is the author of many books, including the children's stories Tony's Hard Work Day (illustrated by James Stevenson, 1972), The Lemming Condition (illustrated by Joan Sandin, 1976), Halfway Through the Door: An Actor's Journey Toward Self (1979) and The Clearing (1986 continuation of Lemming). In March 2011, he released his memoir, An Improvised Life. Arkin has been married three times. He and Jeremy Yaffe (m. 1955-61) have two sons: Adam Arkin, born August 19, 1956, and Matthew Arkin, born March 21, 1960. He was married to actress-screenwriter Barbara Dana from 1964-mid 1990s. They lived in Chappaqua, New York. In 1967, they had son Anthony (Tony) Dana Arkin. In 1996, Arkin married psychotherapist Suzanne Newlander. They live in Carlsbad, California. ↑ "Alan Arkin Biography". filmReference.com. Retrieved May 12, 2008. 1 2 Sierchio, Pat (February 16, 2007). "Alan Arkin—not just another kid From Brooklyn". The Jewish Journal of Greater Los Angeles. Archived from the original on February 23, 2007. Retrieved February 16, 2007. ↑ "Actor brings creative ways to Honolulu for workshops | The Honolulu Advertiser | Hawaii's Newspaper". The Honolulu Advertiser. 2004-01-27. Retrieved 2013-03-28. 1 2 "Alan Arkin biography". Yahoo! Movies. 2008. Archived from the original on December 16, 2006. Retrieved December 9, 2006. ↑ Farrell, Barry. "Yossarian in Connecticut: Since Catch-22, actor's actor Alan Arkin finally stars as ... Alan Arkin" Life magazine. October 1970. ↑ Lovece, Frank. "Fast Chat: Alan Arkin". New York Newsday. January 7, 2007. ↑ FolkEra.com: The Tarriers. FolkEra.com. ↑ "Alan Arkin Biography". Hollywood.com. Retrieved April 9, 2007. ↑ Rabin, Nathan (August 2, 2006). 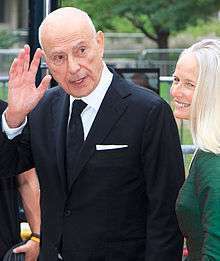 "Interview: Alan Arkin". The Onion AV Club. Archived from the original on February 9, 2009. Retrieved March 20, 2009. ↑ "Dreamgirl" Jennifer Hudson Wins Oscar. NewsMax.com, February 26, 2007. ↑ Canby, Vincent (February 21, 1971). "What's So Funny? Murders". New York: New York Times. p. D1. Little Murders succeeds, at times triumphantly, and it does everything more or less backwards. ↑ "Roger Ebert's review". Rogerebert.suntimes.com. January 1, 1971. Retrieved 2013-03-28. ↑ "Alan Arkin Biography - life, family, children, name, story, school, mother, young, son - Newsmakers Cumulation". Notablebiographies.com. Retrieved 2013-03-28. ↑ Lague, Louise (March 26, 1979). 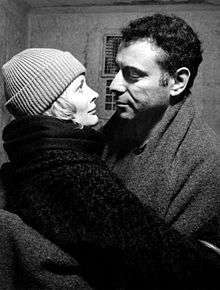 "Stardom Was a Catch-22 for Alan Arkin, but His Wife and a Guru Helped Beat the System". People Magazine. Retrieved 21 August 2015.